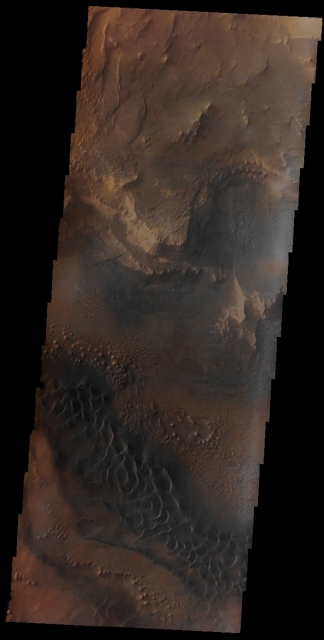 In this beautiful VIS image, taken by the NASA - Mars Odyssey Orbiter on December, 30th, 2002, and during its 4.622nd orbit around the Red Planet, we can see a small portion of the wide Martian Canyon known as Melas Chasma. Melas Chasma is the Widest Segment of the Great Valles Marineris Canyon System, and it is located to the East of Ius Chasma, at about 9,8� South Latitude and 283,6� East Longitude, in the Coprates Quadrangle of Mars. Melas Chasma cuts through Layered Deposits that are thought to be Sediments in origin, which came from an ancient Lake that might have been created by runoff of the Valleys Network found to the West. On the other hand, other (credible) theories include that the Layered Deposits cut by Melas Chasma originated from Windblown Sediment Deposits and Volcanic Ashes. A substantial support relevant to the presence of abundant (of course in a remote past) Water inside Melas Chasma, has been found in the discovery, made by the NASA - Mars Reconnaissance Orbiter (or "MRO", for short) of Hydrated Sulfates all over the place. In addition, the presence of Sulfate and Iron Oxides (---> notice how dark are the Dunes visible in the lower part of this image) were found by the same Orbiter. Furthermore, in a recent (*) study of the South/Western Portion of Melas Chasma - a study founded on the use of High-Resolution Orbital Images, Topographic and Spectral Datasets - showed the presence of 11 (eleven) Fan-shaped Landforms, whose existence added credibility to the already growing evidence that Melas Chasma, once, should have held a large and long Lake which must have also had Fluctuating Levels (---> High and Low Tides). The Canyon's depth suggests that this location may be, hopefully in a not too distant future, one of the best Sites for a Permanent Manned Outpost on Mars, since it would have the highest Natural Air Oressure on the whole Red Planet. Furthermore, the excellent Peri-Equatorial Solar Irradiation (which is available even during the long Martian Winter), as well as the (relatively easy) access to Underground Water-Ice, would - obviously - enhance this already highly suggestive option even further. (*) ---> Drr Williams, R. and C. Weitz: "Reconstructing the Aqueous History within the South/Western Melas Basin, Mars: Clues from Stratigraphic and Morphometric Analyses of Fans". (Icarus: 242, 19-37). This image (which is an Original Mars Odyssey Orbiter falsely colored and Map-Projected frame published on the NASA - Planetary Photojournal with the ID n. PIA 19218) has been additionally processed, magnified to aid the visibility of the details, contrast enhanced and sharpened, Gamma corrected and then re-colorized in Absolute Natural Colors (such as the colors that a normal human eye would actually perceive if someone were onboard the NASA - Mars Odyssey Orbiter and then looked down, towards the Surface of Mars), by using an original technique created - and, in time, dramatically improved - by the Lunar Explorer Italia Team.